Established in 2007, the Meds & Eds Group was organized to bring together a diverse group of CREW Boston members interested in serving the academic and medical sectors of the real estate industry. The Meds & Eds group meet to see what is on the horizon, share best practices, and get together to exchange information and ideas. CREW Boston's Meds and Eds Group hosted a Conversation and Coffee with Deb Poodry, Senior Advisor, Capital & Space Planning, Facilities Management, UMass Lowell on November 9th. Deb shared the many advances that have been taking place at UMass Lowell that led to a significant change in University ranking, reputation, enrollment and campus development. Our members gleaned insights into how an institution successfully navigates major change when the majority of projects are undertaken in one sweep. 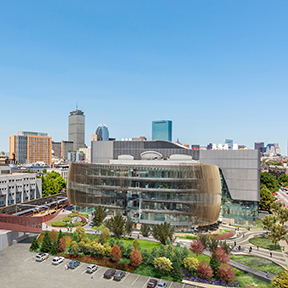 UMass Lowell's progress and achievements are stunning. On Tuesday, November 10, Bob Biggio, Vice President of Facilities at Boston Medical Center, addressed the Meds & Eds Networking Group at Payette’s offices. Bob gave an overview of BMC’s $300M project to renovate their main Albany Street campus in Boston. He talked about how the changing healthcare climate and BMC’s financial challenges led to a new approach to physical space. The hospital is now viewed as a model for future hospital turnarounds in the U.S. The topic generated lots of questions and a great discussion.